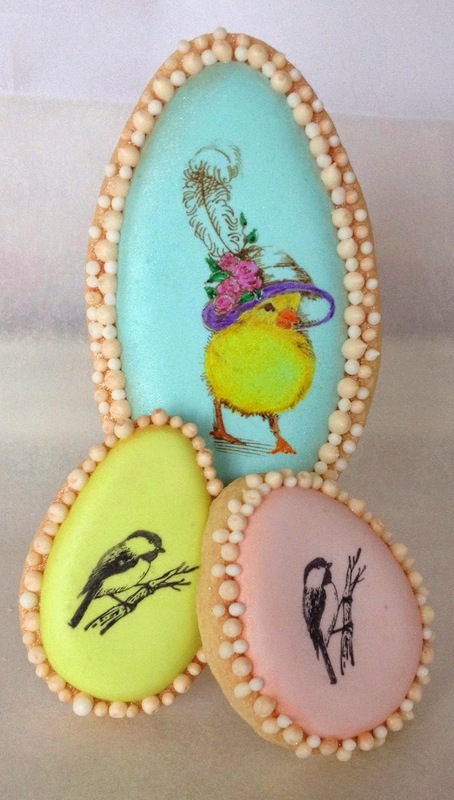 From Captain's Daughter to Army Mom: Inspired through Inspiring Others... An Easter Cookie Story! 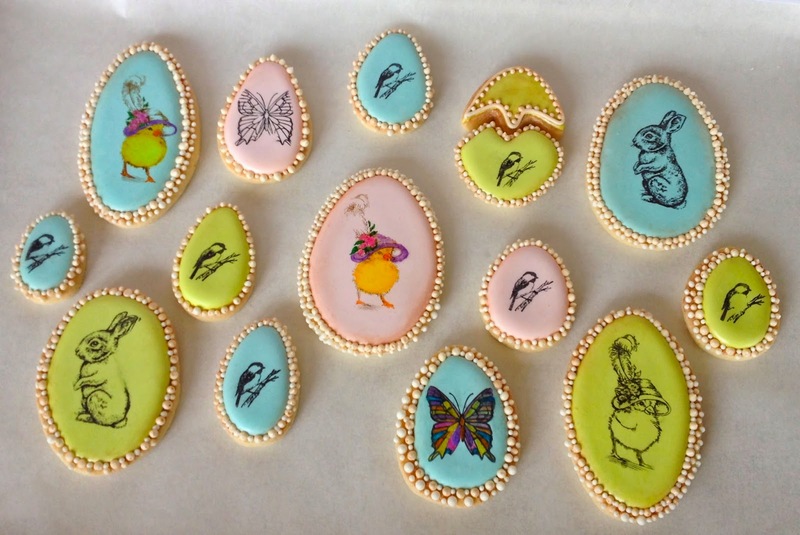 Inspired through Inspiring Others... An Easter Cookie Story! 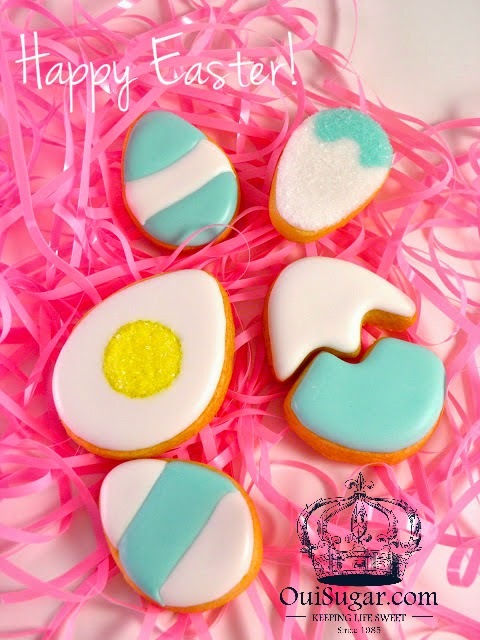 not cut, roll, bake or decorate one Easter cookie of my own this year! 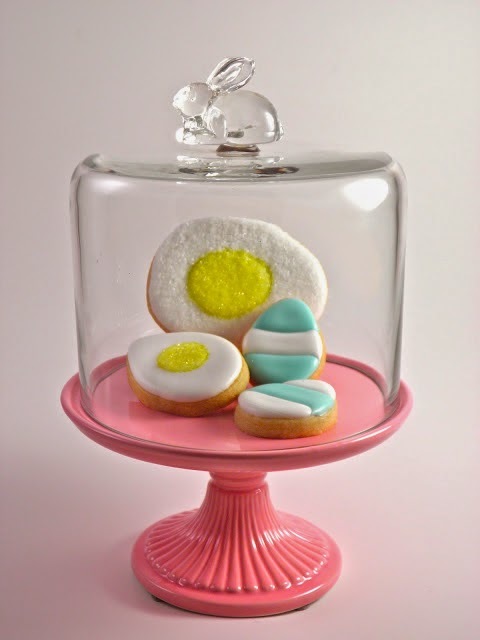 most perfect Easter cookie cutter set ever made and love to use it! created using the same vintage Marth by Mail Egg Cookie Cutters I have! 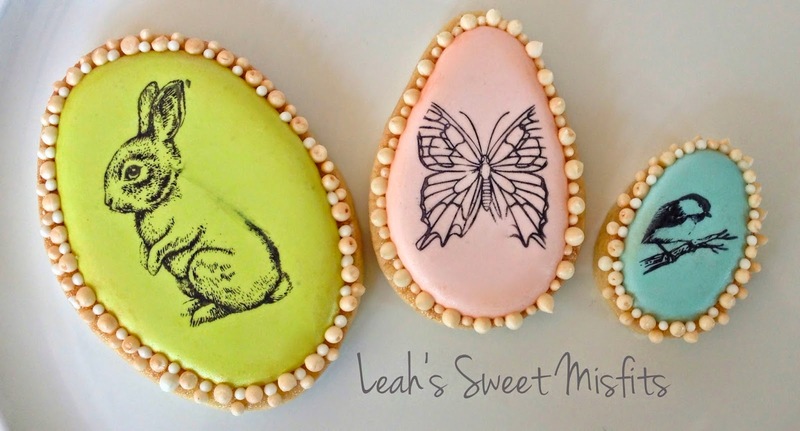 look at all of these beautifully stamp-decorated cookies Leah created! a delicate vintage Victorian look! I think Leah's cookies are stunning, don't you? she said were flaws in her stamping... She called this trio her sweet misfits! 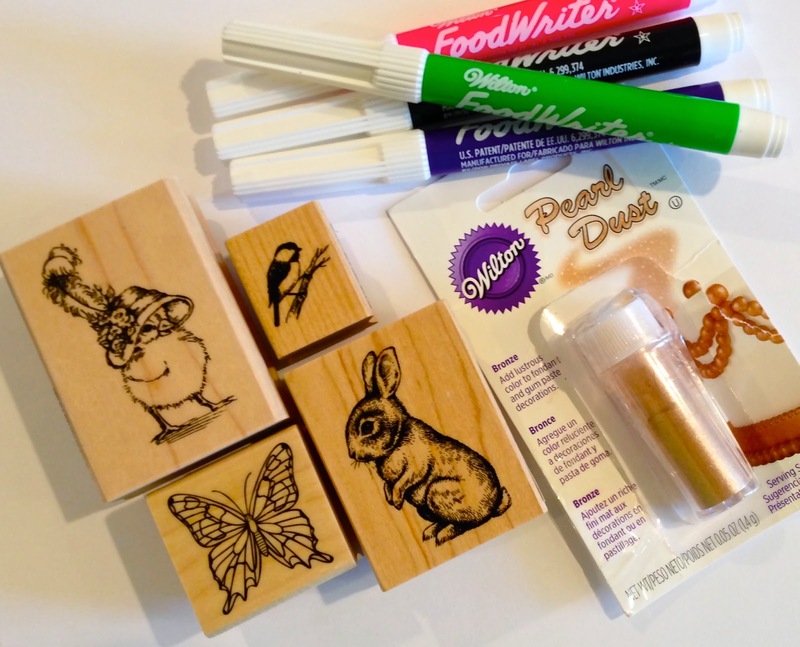 since I saw Leah's cookies, I've been looking at rubber stamps in a whole new way! 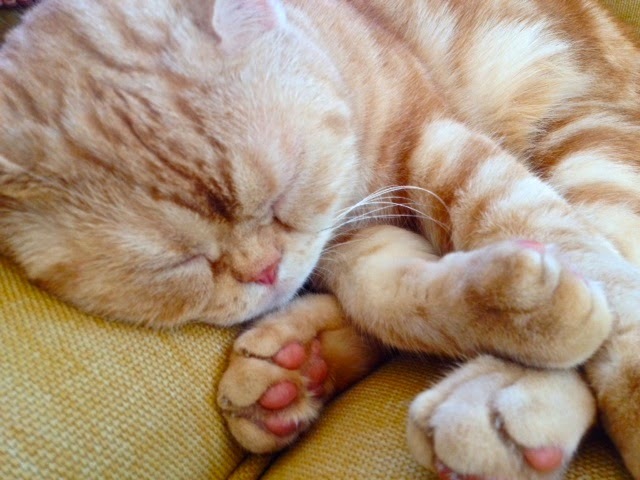 if her sweet Oscar-kitty were mine, I'd have difficultly leaving his side! ago, I received the following e-mail from one of my readers and Oui, Sugar! sister Traci and cousin Mary. Hello, ladies - We all love your cookies! 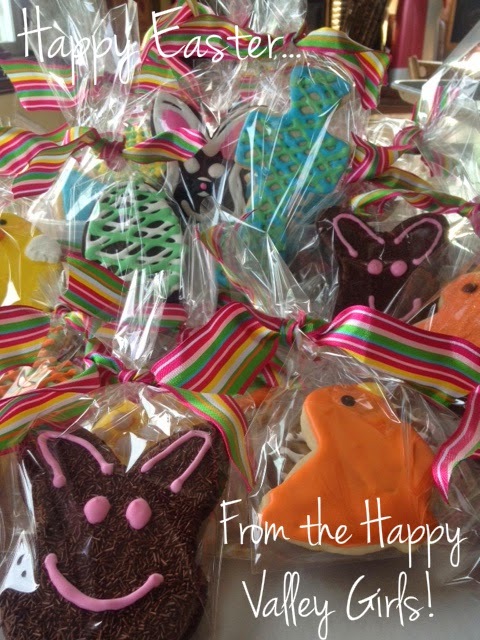 to discover tucked into their Easter baskets this Easter Sunday weekend! and I am... More than they know! I say, Bravo! and, Well Done! to sisters, Teri, Toni, Traci and their sweet cousins, Joanne and Mary! Pretty cookies and a cookie decorating party. I love it. Think I'm going to have to have one of those this Summer. Janet, this post is BEAUTIFUL and not because my cookie pictures are in but because your HEART is in it! You have a gift of making others feel so special and connected in this world. Your warmth and generosity are beyond measure. Thank you for being a wonderful and supportive teacher who encourages the creative cookie in all of us! YOU truly bring new meaning to the word INSPIRATION! 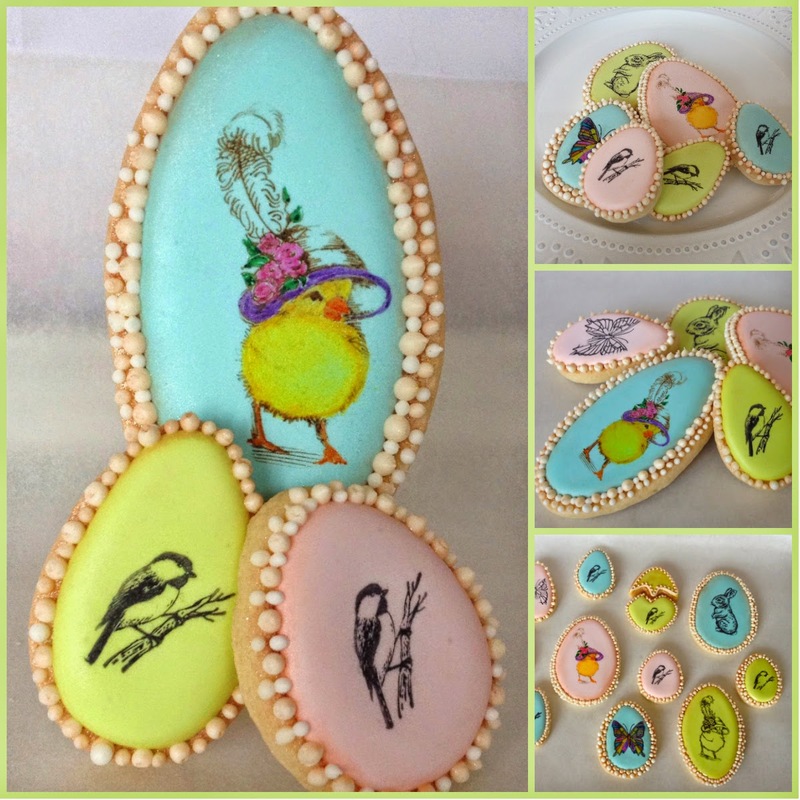 Love the pictures of Teri and her cousins and their fabulous cookies! .......makes me wanna plan a cookie party!!! Many, many thanks again for all your encouragement! 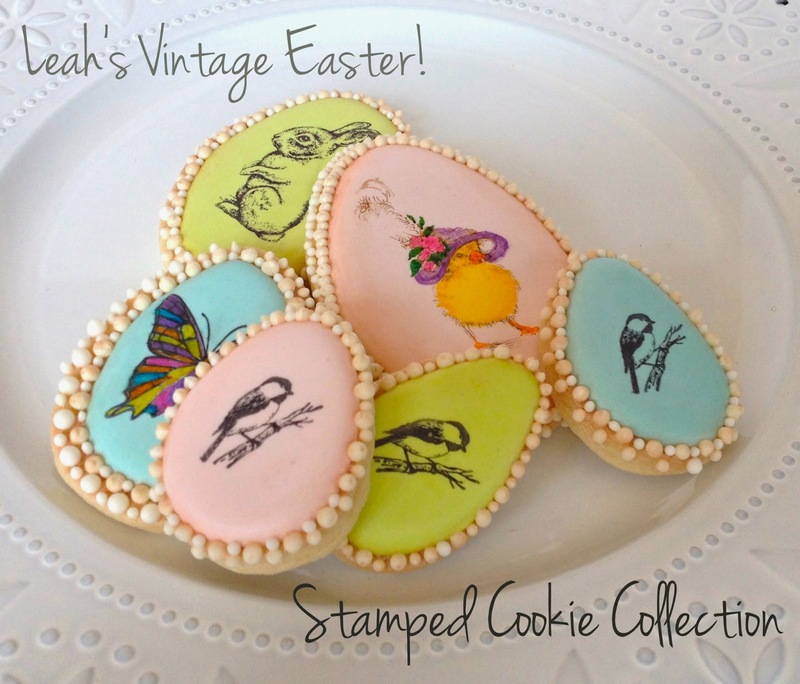 Thanks for sharing these lovely stamped cookies and this wonderful post. Happy Easter! Wow! We made the blog!! 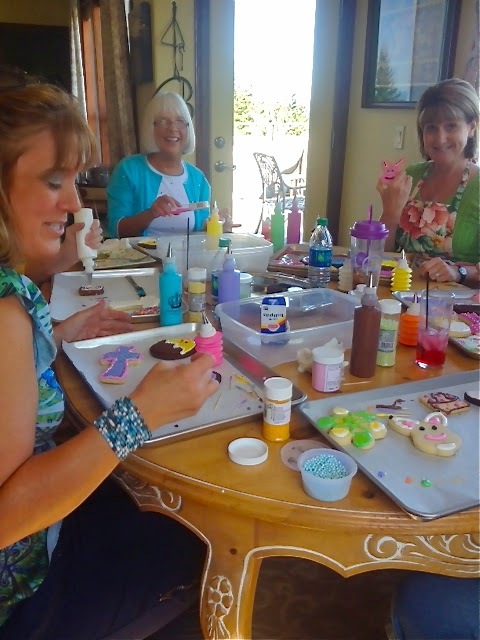 What a great surprise to be curled up reading Janet's blog tonight only to find pictures of our cookie decorating party! My extremely talented sister, Teri, hosted us this past Sunday for a whole lot of quality cousin-time as we decorated the perfect cookies she and sister Toni made a couple days earlier. Teri had all the supplies ready to go for us, many of them purchased from Oui Sugar. I know she is inspired by you, Janet, and all your beautiful creations. And never think that no one reads your blog as there are lots of us out here who check in daily, hoping for a new entry. We talk about your cookies all the time! I can't wait for everyone to see these beauties on Easter Sunday. That is if I can keep from telling them that we're on the blog! Thanks for the love, Janet- right back at ya! How fun to find us on this blog, that I now need to follow..Teri's cookie parties are so fun and we laugh so much it is a wonder we decorate any cookies..Now I will follow your blog for future inspiration..Thanks to Teri for introducing it to me. Thanks for the great post Janet -- I never dreamed I'd ever see my name associated with your most awesome blog! Your cookies are always so beautiful and they have always inspired me. 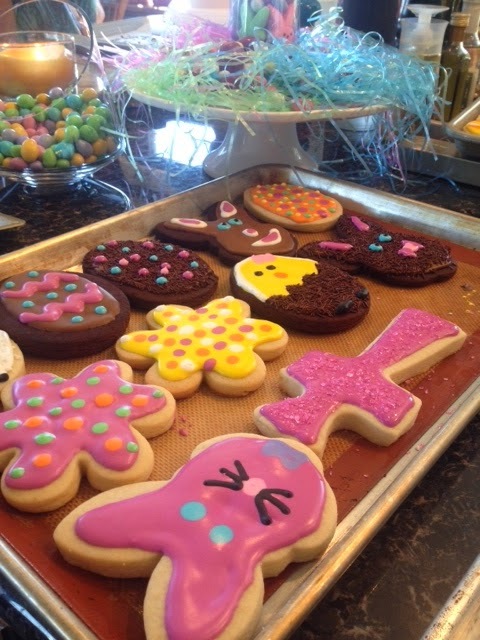 I am very impressed with the intricate details of Leah's cookies as well -- all those individually placed sugar pearls! What a wonderful way to connect with family and or friends, years ago the women folk would gather to do big cooking and sewing projects, this is a great way for us women in 2014 to get to do this. I really like this idea. Another way maybe we do by "connecting" on-line and meeting new people. So please don't think nobody reads your blog, we don't all have the time to say so.....sorry. But we do read it and it is a very worthwhile read. You may remember how I said that I love cake stands (I'm one of the cookie cutter winners) anyhoo I adore your bunny cake stand, so adorable! I wish your family a very blessed Easter! It was an amazing cookie decorating party! I am so blessed by family (our parents were one of ten children), and each of my cousins have immense talent! Teri puts on such a fun party that when her friend stopped by, she begged to join our group! She's not a cousin, tho! :) I am so inspired that now I am hosting a cookie decorating get together! I am hosting a bridal shower - part of the take-away bags for guests will be a decorated flip flop cookie (as suggested by Teri). Teri is my mentor in this process and is getting me set up with all the tools I will need to host this party successfully! So your impact is widespread, Janet! Keep on bloggin'!